The Daewoo KOR6L6BDBK features a handy shelf for heating two plates simultaneously, as well as 20 litre capacity and 800w of power. Easy to use, well labelled controls. Slightly noisy - other than that it's good. We've already reviewed this microwave once, albeit a white coloured version. This particular model is finished in black, and provides 20 litres of capacity, 800w of power and a handy shelf feature. 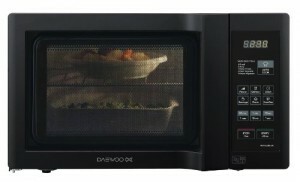 It doesn't include a grill or convection oven - however the Daewoo KOR6L6BDBK does offer pretty good value. The outer measurements are a modest 44.6cm by 27.0cm by 32.4cm, and it also feature 5 different power levels. The controls are button based rather than dials, and offer an easy method of operating the Daewoo microwave, thanks to their clear labelling. The interior is easy to clean, and the overall design is fairly understated - our testers were complimentary about the looks and build quality of this solo microwave. It performed well during the test period, and cooked food effectively without any noticeable cold or uncooked spots. The handy shelf feature is the main selling point - enabling you to cook or heat two dishes at the same time - ideal for when you wish to eat together. Works well, and offers good value - if you're after a cheap solo microwave then the Daewoo KOR6L6BDBK model is well worth considering.